The 2015 MINI Cooper Paceman is a crossover vehicle that offers versatility and efficiency. However, the Paceman’s creative styling remains one of its most adoring attributes. While the base model is great for daily commuting, the high-powered John Copper Works model vows to deliver an engaging driving experience. Fortunately, all versions of the Paceman are tuned to deliver good gas mileage. The availability of an all-wheel-drive system makes it a very capable performer during the winter. Very little has changed for the 2015 model year. Prospective buyers will get the opportunity to choose from a few new colors. In terms of uniqueness, very few vehicles on the market can match the MINI Copper Paceman. The car’s two-door design helps it to stand out from the crowd. Featuring 18-inch wheels and a lowered ride height, the John Copper Works model displays a very athletic appearance. In regards to fuel efficiency, the base model is rated at 27 mpg in the city and 34 mpg on the highway. Even the potent John Copper Works model is able to deliver at least 30 mpg on the open road. The Paceman’s efficiency is a major benefit to budget-minded drivers. Although the base engine only produces 121 horsepower, it provides just enough muscle to move around the Paceman. Meanwhile, the S model pumps out a lively 181 horsepower and 177 pound-feet of torque. With a total output of 208 horsepower and 192 pound-feet of torque, the John Copper Works model boasts the most powerful engine in the lineup. Drivers love the Paceman’s versatility. When the rear seats are folded flat, a wide variety of different items can be hauled in the back. Despite the car’s small stature, the backseat is surprisingly spacious. A family of four will certainly be able to fit comfortably. On the road, the 2015 MINI Cooper Paceman is a joy to drive. If desired, buyers can also upgrade to a sports-tuned suspension system. A responsive steering system helps the driver to remain engaged at all times. When activated, the Sport mode effectively elevates the Pacman’s fun factor. The Paceman’s elevated ride height allows the driver to gain a clear view of the road ahead. While the Paceman is not a traditional SUV, it still sits a tad bit higher than some of the other cars in its class. While there are cheaper alternatives on the market, the Pacman is still viewed as a relatively good bargain. For about $24,000, prospective buyers will be able to purchase a base model. However, a fully-loaded JCW model carries a price tag of more than $35,000. A front-wheel-drive system comes standard. Fortunately, drivers can also upgrade to a convenient AWD system. Although the Paceman is not known for its off-road capabilities, the crossover vehicle is a capable performer in wintry weather. The base model comes furnished with several neat features, including a chilled storage compartment and a USB port. Some of the optional creature comforts include xenon headlights, a panoramic sunroof, and a thumping Harman Kardon audio system. The MINI dealership allows shoppers to design their new Paceman with a custom interior. People who have an artistic mindset will surely enjoy the opportunity to showcase their creativity. The crossover’s unique interior also gives it a distinct advantage over the competition. While the Paceman does offer plenty of cargo space with the rear seats folded down, the hatchback area is rather small in comparison to other vehicles. This could present a challenge for the families who love taking long-distance road trips. Although the Paceman is not unreasonably expensive, there are still more affordable options on the car market. Crossover vehicles such as the Mazda CX-5 and the Ford Focus are a tad less costly. In terms of safety equipment, the 2015 MINI Cooper Paceman comes equipped with the basic essentials. Advanced safety features such as blind-spot monitoring are not offered. However, dynamic traction control is offered on the upper-level trims. Due to the fact that the Paceman is such a unique driving machine, it is able to compete against an array of different vehicles. However, the Nissan Juke and the Mazda CX-5 serve similar functions. 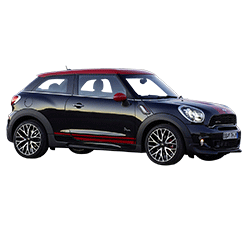 The 2015 MINI Cooper Paceman’s jazzy styling and nimble road manners make it a worthy choice. While the base engine produces a mild performance, the available turbocharged models deliver a strong punch. This is the perfect vehicle for the drivers who refuse to blend in with the crowd.